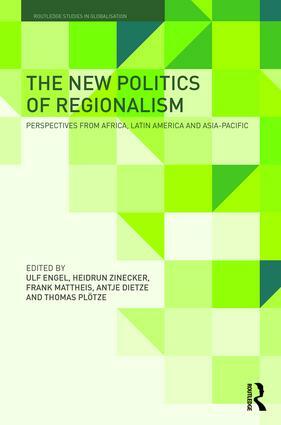 This edited volume approaches regionalism as one potential pattern in a changing global order. Since the end of the Cold War, different forms of territorialization have emerged and we are confronted with an increasing number and variety of actors that are establishing regional projects. This volume offers an innovative contribution to the study of this new complexity by exploring constellations of regional actors, spatial scales and imaginations beyond state-centred perspectives as well as on multiple, often overlapping levels. The chapters analyse the emergence, trajectories and outcomes of regionalisms from the perspective of the Global South, specifically concentrating on regional projects in Latin America and Africa, but also in the Asia-Pacific. They attempt to identify the specific conditions and junctures of different forms of region-making in their external (global) and internal (local/national) dimensions. The volume also places special emphasis on interactions, spatial entanglements and comparisons between regionalisms in different parts of the world. By expanding beyond the perspective of North-South transfers, this book seeks to better understand the dynamics and diversity of interregional interactions. This volume will appeal to scholars of global studies, international political economy, international relations, human geography, and development studies, as well as area studies specialists who focus on Latin America and Africa. 6 Is interregional AU-ASEAN diffusion in the South barren? Ulf Engel is professor at the Institute of African Studies and the Global and European Studies Institute at the University of Leipzig, Germany. Heidrun Zinecker is full professor and Chair for International Relations at the Institute of Political Science at the University of Leipzig, Germany. Frank Mattheis is a senior research fellow at the Centre for the Study of Governance Innovation (GovInn) at the University of Pretoria, South Africa. Antje Dietze is a senior researcher in the Collaborative Research Centre 'Processes of Spatialization under the Global Condition' at the University of Leipzig, Germany. Thomas Plötze is a research associate at the Institute of Political Science at the University of Leipzig, Germany.